Learn about the different ways to handle client deposits, overpayments, credits and discounts. Learn how to enter a client deposit (which is when a client pays for a contract in advance), an invoice overpayment (which is when a client overpays an invoice), and a client credit (which are given if a client returns an item or overpays an invoice). Any time you hold client funds in trust for services that have not been performed or products that have not been delivered, it's considered a liability, since the income has not been earned yet. So, before the income is earned, you temporarily place the money into a Client Credit type account, like the Deposits from Clients account. Likewise, if a client has returned an item or overpaid for an invoice, this is also money that you're holding in trust for a client , so it also needs to recorded as a liability. Credits can also be recorded using the Deposits from Clients account, since deposits and credits act in the exact same way. When the income is earned, you apply the deposits or credits against the invoice, which moves the money from your client credit account (a liability) into your income account. 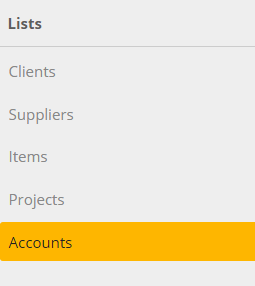 If you have removed your Deposits from Clients account (by default, your chart of accounts will have this account), then you can add it back by going to the Accounts page. Description: A description isn't necessary, but you can add a description like "Deposits received from client in advance and/or credits given to clients". Type: Make sure to choose the Client Credit account type instead of a regular liability account, since this account type has special properties that allows you to apply funds within it as payments for invoices. 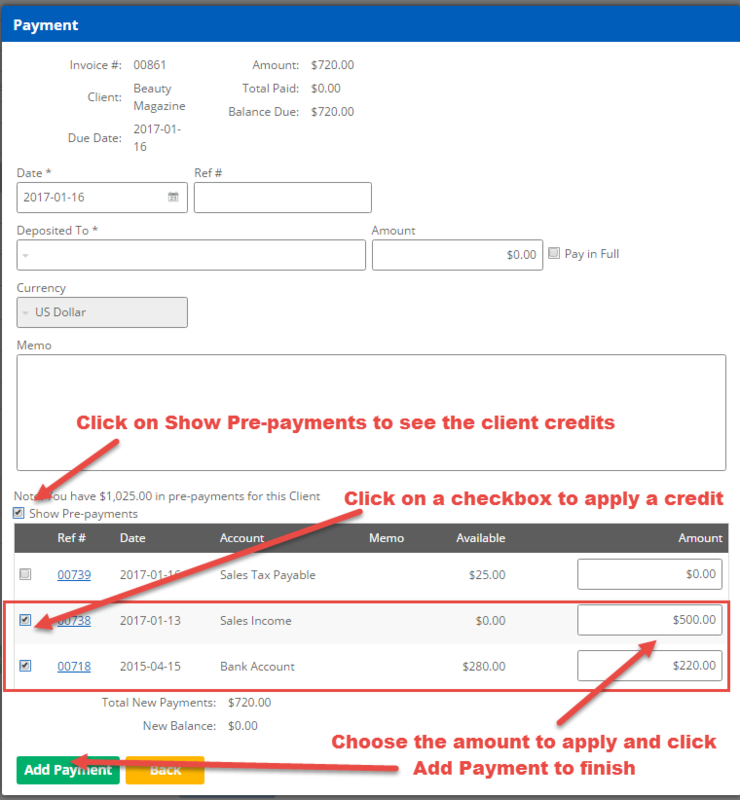 Here's an example of how to record a payment that a client makes in advance for a project (i.e. a deposit). First, go to the Invoice page. Then go the Enter Payment tab. You fill out the fields like you would for a client payment for an invoice, so for the Deposited To, you choose the account you will deposit the funds into. However, instead of selecting an invoice to pay, for the Pre-payment, credit, and overpayment field, choose the Deposits from Clients account and enter the deposit amount. 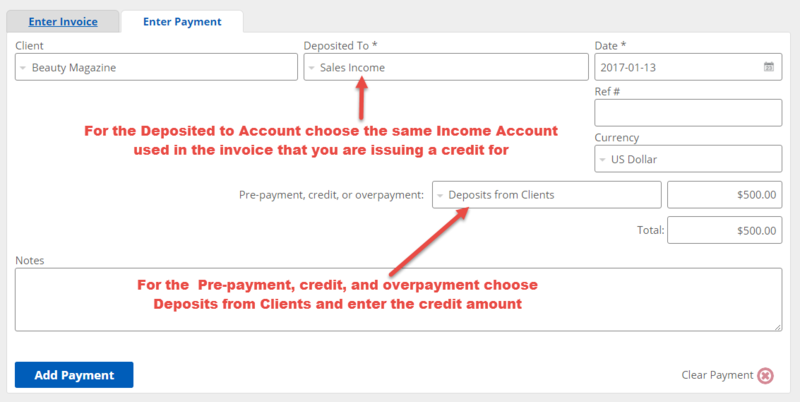 Alternatively, if the client overpaid for an invoice, an invoice to be paid is selected. Additionally for the Pre-payment, credit, and overpayment field, field, you choose the Deposits from Clients account and enter the overpayment amount. 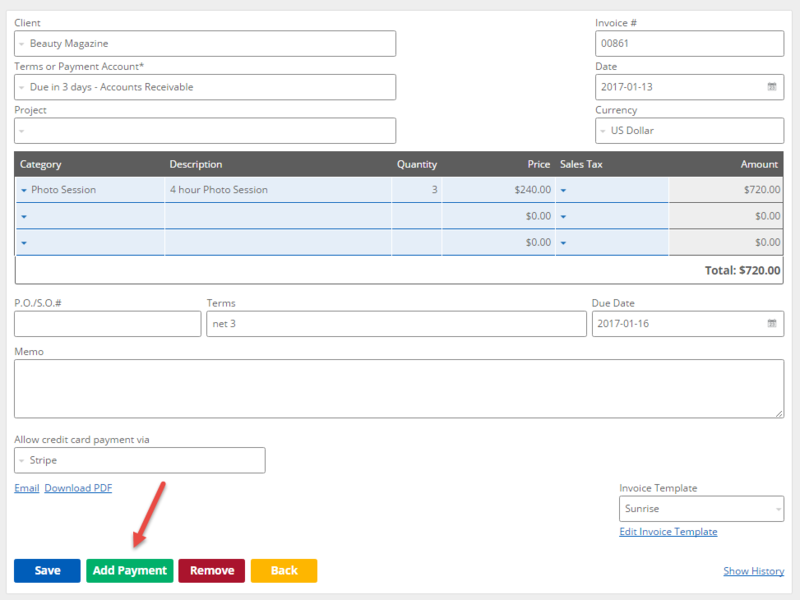 Entering a credit, or discount that is applied after the invoice is already created, is also very similar to entering a deposit. The difference is that you would use an Income Account for the Deposited To. For example, if the invoice that you're issuing a credit for used the Sales Income account for the Income account, then that's the account you would enter into the Deposited To field. If you charged taxes on the invoice, you need to make sure that you create an additional payment credit for the tax charged. So, if the sales taxes charged was 5%, you'd enter an additional credit for $25.00 that credits the Sales Tax Payable account. Note: The name of your Sales Tax Payable account will probably be different, since the account will start with whatever your tax name is called. So, if the name of your sales tax were called "State Tax", then your account would be named State Tax Payable. 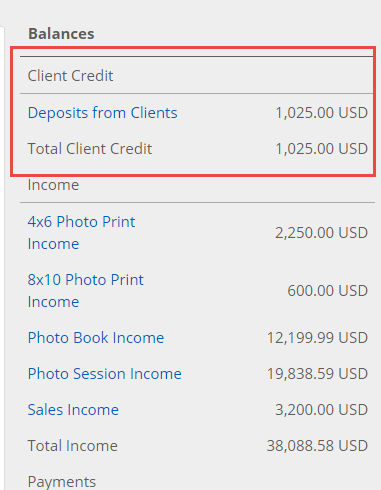 To see the deposits/credits that a client has, go to the Clients page and choose the client. 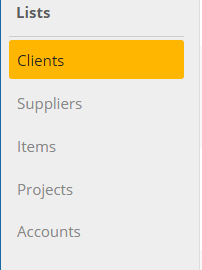 On the right hand side of the client's profile you will be able to view the balances, which includes a section for Client Credits. Applying funds found in the Deposits from Clients account to an invoice is easy. 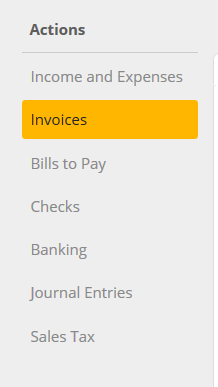 All you need to do is go to the Invoices page and click on an existing invoice. Then click on the Add Payment button.